NEW YORK--(BUSINESS WIRE)-- This holiday season, even the most experienced shopper may need to grab some last-minute gifts for the special people on their list. With a curated assortment of this season’s most coveted items, Macy’s is the gift destination for everyone’s holiday needs. Whether it’s a last-minute hostess present for a late-breaking party invitation or a round of colleague gift exchanges, shoppers can take advantage of Macy’s must-haves across fashion, home and beauty. If you need a little assistance, the experts at MyStylist@Macy’s can help suggest a great last-minute gift or the perfect holiday outfit. Macy’s shipping options can also help relieve the stress of last-minute shopping. Customers can receive gifts in time for Christmas when ordering online at macys.com or via the Macy’s app by Dec. 20 at 5 p.m. Those who need every minute to spare can buy select gifts online by Dec. 24 at noon and pick them up in store that day. Give the gift of warmth this holiday season with cashmere from Charter Club. 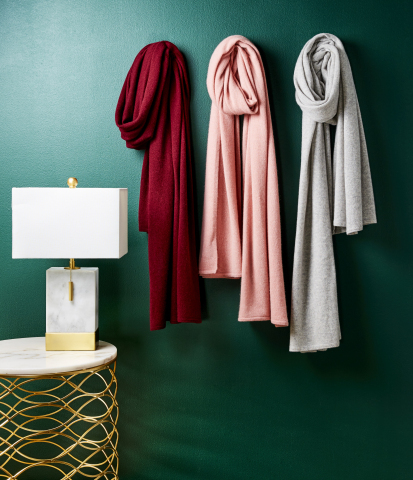 Whether a scarf or a sweater, cashmere adds a touch of luxury to her holiday dressing. Pendant necklaces with astrology signs from Unwritten are the perfect personalized gift. For the tech-savvy woman on your list, a smart watch from Michael Kors allows her to track her health and time in style. This trendy watch, available in silver, gold and rose gold, is a perfect fit for the woman on-the-go. Upgrade his winter style with new knit hats and scarves from Polo Ralph Lauren. Complete with the iconic Polo bear logo, these knit accessories are sure to complement his holiday look. Bring some warmth to his wardrobe with a Sherpa denim jacket from Levi’s. This cozy upgrade to a classic jacket style will be a staple that adds warmth and swagger to his outfits. Matching sweatshirts and sweatpants from Nike are great last-minute gifts that will elevate his casual attire. This holiday season, kids can rock the latest trends with stylish pieces from Tommy Hilfiger. Bold logo tees, hoodies and color-blocked puffer jackets will be a hit for kids and teens. Onesie pajamas from Max & Olivia make family photos and opening gifts on Christmas morning all the more fun with vibrant patterns and animal ear accents. For the beauty lover on your list, fragrance sets from brands like Versace, Gucci, Tiffany and Prada make gifting effortless and scent-sational. Additionally, customized gifts wrapped in Macy’s lovely complimentary gift boxes from top brands make gifting easy and ready to slip under the tree. Dress up your Christmas tree with beauty ornaments from Clinique and IT Cosmetics. These fun ornaments come in fun shapes and add an unexpected twist to classic holiday décor and will surprise and delight as stocking stuffers. Each ornament comes with cult-favorites for her to try out and rock during holiday parties and family gatherings. Have a hectic holiday party schedule or need a gift for the welcoming host? Macy’s makes it easy to create a beautiful tabletop or gather friends with fun party games. Set the table with festive placemats, dinnerware and drinkware from Cellar. This collection features vibrant and festive colors that will bring the dining table to life. Create memories that will get any party started with a round of Champagne Pong by Studio Mercantile. This modern update to a classic party game gives guests an elevated experience to remember. For the chef, an air convection fryer from Crux makes for easy cooking and healthier holiday options. This coveted kitchen appliance will be the top gift under the tree. To delight the wine lover in the family, Macy’s Wine Cellar has the perfect range of last-minute holiday gifts – from beautifully packaged Champagne and Prosecco to fine Bordeaux and crystal glasses. With prices starting at just $24.99, there’s something for every taste and budget. Check out macyswinecellar.com/gifting for more ideas. On December 14, Macy’s customers can participate in Free Shipping Day. Customers will enjoy free Standard delivery with no order minimum on most macys.com and mobile app orders, beginning at 9 a.m. EDT. Any order placed on Dec. 14 will arrive in time for Christmas. Macy’s shipping options – get them in time! Get gifts in time when ordering online. Shoppers can purchase gifts on macys.com or on Macy’s mobile app by Thursday, Dec. 20 by 5 p.m. EDT with Standard shipping for delivery before Christmas. For those who need a little more time in qualifying delivery areas, the order can be placed online by noon EDT on Friday, Dec. 21 with Express delivery to be delivered in time for Christmas. Macy’s customers can take advantage of buying online and picking up in store, which allows shoppers to buy their gifts online or through the Macy’s mobile app and pick up the items at the Macy’s store most convenient for them. What’s more, orders placed by noon on Monday, Dec. 24 can be picked up that afternoon by 6 p.m. in time for Christmas! For those who need a little extra last-minute assistance, the gifting and styling experts of MyStylist@Macy’s can help find the perfect present or a head-to-toe look for your hectic holiday schedule. This free personal service is available for in-store customers in select locations. Book an appointment online at macys.com/mystylist. Take the stress out of the last-minute gifting with a Macy’s Gift Card and let your loved ones pick out something special online or in-store. Visit macys.com/Gifts to learn more about Macy’s Gift Guide, get inspiration, and shop the curated assortments for everything you need this holiday season.